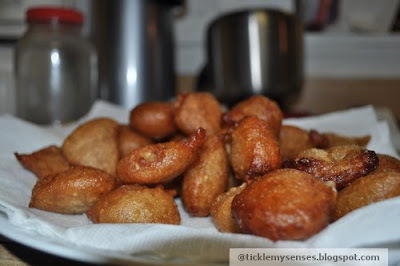 Tickle My Senses: Heera's Ghariyo- Sweet Banana Fritters. Heera's Ghariyo- Sweet Banana Fritters. The first time i tasted this traditional Mangalorean sweet was on my recent trip to the US. My sister-in law Heera is an awesome cook and makes a lot of traditional Mangalorean food. One evening for tea Heera fried up these tiny brown crisp sweet dumplings made up of rice, ripe bananas, jaggery and coconut. A tasty treat for a rainy day with a hot cuppa coffee. Traditionally ghariyos are made using jackfruit, however bananas being more readily available can also be used. 1.Soak washed rice overnight and then grind with bananas and jaggery to a thick and fine paste without adding any water. 2. Add grated coconut, rice flour, salt and cardamom powder and grind for 5 more minutes. 3. In a pan take sufficient oil for deep frying, place on a medium to high flame. Once oil is hot spoon out the ground mixture into the oil carefully. Make a few at a time. Turn over when one side brown and fry the other side. 4. Ladle out the fried fritters using a sieved metal spoon onto absorbent tissue paper. I have had jack fruit ghariyo but never banana ones. gonna make these soon! Are you Heera D'Souza/Pereira's relative??? Yes Preeti S ....she is married to my husbands brother. How do you know her? ?